Pisa string duet (33.03): Derek Bailey, guitar; Maarten Altena, double bass. 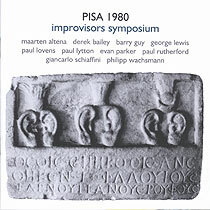 Recorded on 26, 27, 28 June 1980, tracks 1, 2 and 3 on CD 1 in the Giardino Scotto open-air theatre, Pisa; all other tracks in San Zeno Abbey, Pisa. The Rassegna Internazionale del Jazz was organized in Pisa by the Center for Research into Improvised Music (CRIM). The record production was made with financial assistance of the Town Council of Pisa. Cover photographs (front cover reproduced above) by Roberto Masotti, Gerard Rouy. This is a re-issue, with a significant amount of previously unheard music, of Incus LP 37. Track 4 on CD 1 and tracks 2 and 3 on CD 2 are previously unissued and track 3 on CD 1 and track 1 on CD 2 have been restored to their complete lengths for this CD issue.